Almond SPAMANICURE® products soothe tired hands, leaving them baby-soft and smelling oh-so-sweet. Nourishing warm oil hand soak that transforms into a milky moisture bath. Thick hand treatment gently polishes and conditions skin with a blend of mineral salts, refined sugar and jojoba soft beads. Hand mask that deeply conditions and refines, leaving skin with a healthy glow. Silky-smooth hand and body lotion that quickly absorbs into the skin. Perfect starter collection of Almond products. 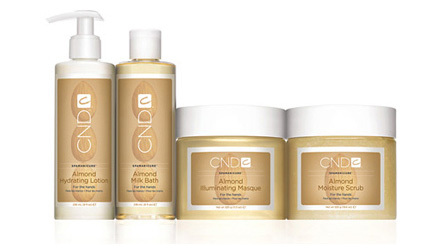 CND® Almond SPAMANICURE® products bring the healing properties of sweet almond oil into your salon or station. A full system of hand treatment manicure products lets you customize each experience for the hands, nails, and skin. Start with Almond Milk Bath, a deeply nourishing warm oil soak that transforms into a milky moisturizing bath. Great for hands, nails, and cuticles. Next, Almond Moisture Scrub polishes away imperfections. Finely-milled mineral salts, refined sugar cane, and jojoba soft-beads gently slough skin, revealing bright, soft, happy hands. Apply the Almond Illuminating Masque to refine skin further. This shimmering manicure product uses a blend of sweet almond oil, jojoba oil, and vitamin E to deeply hydrate and condition. Finally, Almond Hydrating Lotion boasts a whipped blend of jojoba oil and vitamin E, plus a light almond fragrance. Gives skin a soft, smooth finish with one lightweight application.